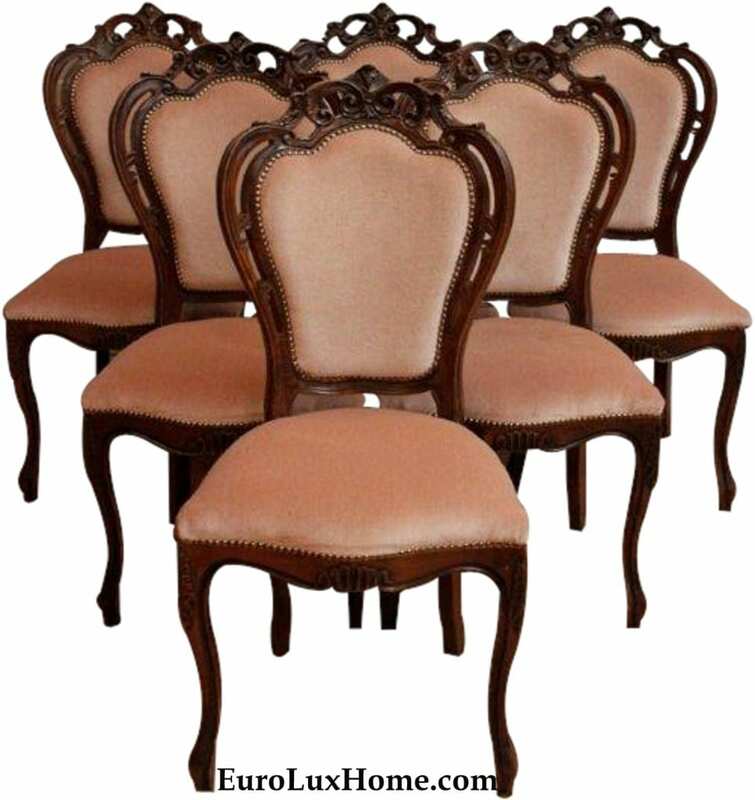 Our customer Fran P. found this beautiful set of vintage French Rococo dining chairs in our listings on Chairish, but she made the smart decision to track down our website EuroLuxHome.com and reach out to me directly for a best price! As Fran only lives about two hours from us in Concord, NC, she decided to drive down to our store in Newberry, SC, in order to pick up the chairs in person. The set of 6 mahogany vintage French dining chairs dates to 1950 and the chairs are full of charming Rococo appeal. The sensuously curvy lines, the cabriole legs, and the carved curlicues on the mahogany wood frame are the perfect match for the chic pinky beige fabric upholstery. The sweet nailhead trim accents the glamorous silhouette, making these vintage Rococo French chairs a truly delicious treat as a dining room set. It was a real pleasure meeting Fran and her daughter, and you can see how truly wonderful the chairs look in Fran’s dining room. Fran said, “It was such a pleasure to visit, your items are beautiful, and we love our purchase!” We are pleased to have such a happy customer and we agree that this set of chairs is perfect for Fran’s dining room. The faded pink upholstery works very well with the pinks, mauves, and cranberry in her rug and she did a great job of finding such a good set of vintage chairs to blend in both color and style with her mahogany Rococo table. The gorgeous gilded Rococo mirror adds even more glam to room. Fran says that she is now looking to replace the brass chandelier. I think this vintage Italian Capodimonte chandelier in our gallery would look fantastic. It dates to 1950 and has an unusual cherub motif that is adorable. The angelic pastel pink and blue colors bring the scenes to life and the metal arms curve in a very elegant way. 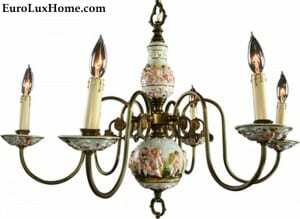 This relatively rare style of six-arm Italian chandelier doesn’t become available very often and so I wanted to share it with our blog readers because it is just so pretty! Or for even more glam, Fran could opt for this stunning new Italian Murano cut glass chandelier! 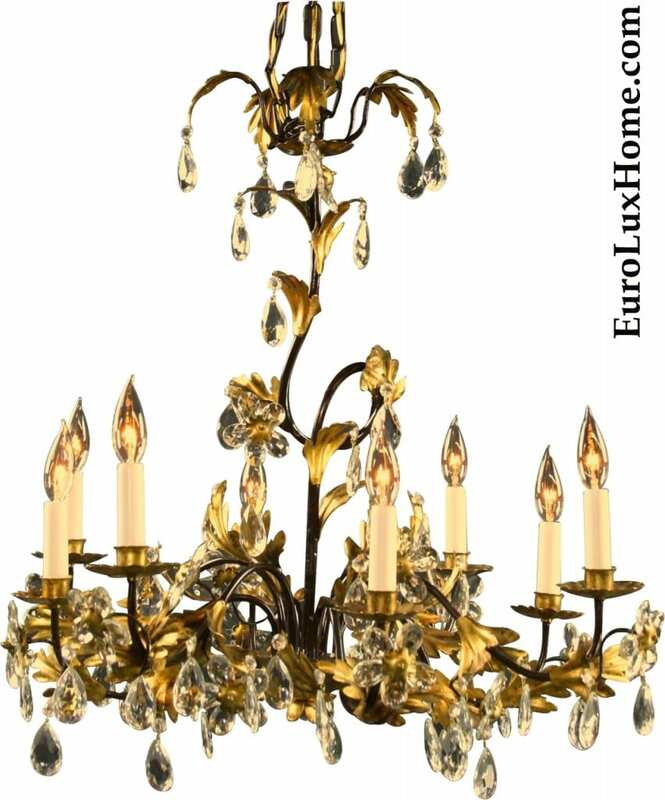 The Rococo style 8-arm crystal chandelier is dramatically crafted with gold leaves and gorgeous clear glass pendants and clear glass flowers. Fran has such good taste that I’m sure that any chandelier she chooses will be the ideal match for the vintage French Rococo chairs and her beautiful dining room. I imagine she will host many elegant dinners in that lovely space! 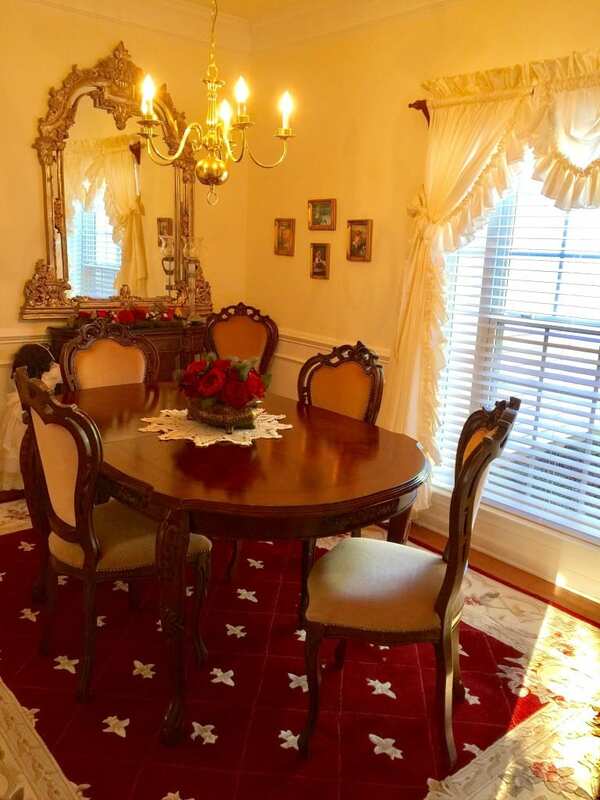 This entry was posted in Client Spotlight and tagged 1950s vintage, decorating with pink, dining chairs, dining room, French Vintage Dining Chairs, French Vintage Furniture, Rococo Style, Vintage Lighting on March 29, 2017 by admin.